Great British Bakeoff: Hot Buns! Previously on the Great British Bakeoff: It was biscuit week, with the Bakewells producing traybakes, tuiles, and cookie towers. Christine shone with a Bavarian clock made from shortbread, while Rob was sent on home. Sue and Mel run down the immense amount of food they’ve already consumed, which is a bit mean to those of us at home. Now I want cake. Dammit. In fake snooty accents, Mel and Sue tell us that the BBC has forbidden them from making puns about buns. Probably more because such puns were kind of crap. I’ll just leave you with that one. Hey, looks like Lucy’s schedule has cleared up enough for her to get a cute new haircut. Signature challenge: tea loaves, which the VO tells us is typically a yeasted bread. It is? I’ve never made a tea loaf with yeast. Other leavenings, like baking powder and soda, yes, but not yeast. Maybe I haven’t actually been making tea loves after all. My bad. Christine’s doing an Oxford nutty loaf to compliment a cheese made near her home. Frances is using chai in her loaf, which’ll have a cinnamon swirl inside. Paul warns her to make sure the structure of the bread is good, with all the folding she’ll have to do. Kim’s doing a chai-spiced ginger and date loaf with a ripple of chai spiced butter in it. That sounds really amazing. Howard’s using hemp flour in his loaf, locally sourced from near where he lives in Yorkshire. Mary’s never heard of hemp and asks about it, so Sue explains that what he has is the legal part of the plant, while the leaves are naughty cigarettes. Heh. Mary seems somewhat intrigued. Mixers buzz, Kim tests her gluten formation. Glen’s using saffron and nutmeg in his Devonshire pannettone. That sounds delicious. Paul asks how he plans to cool it, because apparently they get cooled upside-down. I did not know that. Beca’s doing a Welsh bara brith and she wonders if it really matters when you mix the fruit into the dough. Paul promises to share his own technique after she’s done. Bakewells knead away and set their doughs aside to prove. Which leaves them with nothing to do for an hour, so they pace back and forth and look nervous. Doughs come out and some of them mix in their fruits before putting the doughs in tins for the final proof. Howard’s doing a free-form loaf, and Kim’s doing a plait. Frances carefully folds hers up and puts it in the baking tin. Glenn’s pannettone has barely risen at all. Today’s history lesson is about the bara brith, which is traditionally associated with Wales. We learn about how industrial towns grew up in some areas of Wales and how the families that lived there baked in large, communal ovens. A historian tells us that the little bit of dough left over from the loaves were mixed with raisins, sultanas and currants and that’s where bara brith, or ‘speckled bread’ came from. The most famous variation of it comes from Welsh settlers in Patagonia who traded with local tribes and ended up putting molasses and extra fruit and nuts in the bara brith, which they renamed torta negra, or black bread. They also soaked the fruit in rum overnight, instead of using the traditional tea. Bakewells worry about their breads. Christine says hers hasn’t risen enough, while Howard’s has basically spread out into a dinner plate. Sue helps Christine pass the time by letting her punch a little chef doll. Glenn starts to second-guess himself and rigs up a way to cool his bread upside-down. Christine notes that her bread split, because it was under proved. Glenn’s bread comes out and he manages to get it hung up, kind of freaking Mel out. Howard thinks his bread looks amateurish. They all start glazing and plating. Howard and Christine laugh at their loaf disasters. Ruby’s citrus loaf, which looks beautiful, is up first. Mary loves the deep citrus flavor, while Paul thinks it’s a little doughy inside. The flavours are good for him too, though. Howard’s date and hemp loaf looks healthy, according to Mary, which is not really a compliment. Paul doesn’t like how strong the hemp flavor is. Beca’s bara brith is, apparently, the best bake she could have had with the proof she got. So, a half compliment there. Glenn’s pannettone looks beautiful and Mary compliments the colour inside. Unfortunately, it’s underbaked. Both Paul and Mary like the flavours though. Chrsitine’s nutty fruit loaf is basically raw inside. Paul and Mary can’t even taste it, it’s so underbaked. Too bad. Kim’s delicious-sounding chai loaf is also a bit underbaked inside, but the judges adore the spices and flavours. Frances has served her chai loaf in a giant teacup, and it does, indeed, have lovely swirls. It looks boring outside, but Paul thinks it tastes great and looks nice inside. Post-mortem: Howard’s frustrated with himself for never managing to nail the signature bakes, and Christine really has no idea where her bread went all wrong. Technical challenge: Paul’s recipe for apricot couronne, which is an apricot sweet bread twisted into a crown shape. Glenn has no idea where to begin and some of the others try to apply other bun recipes they’re familiar with. They start cooking, mixing ingredients and working the dough. For those interested, the dough needs to be well worked, or the bread will spread out as it bakes. Dough is put in to prove and the Bakewells prepare the filling, as outside it starts pouring rain. Christine is relieved to see her dough rising. Of course, the recipe doesn’t say how long to prove the dough. Normally it’s until it’s doubled in size, but that’s not really the case with sweet doughs. Tough call. Howard pulls his out, and everyone else sees that as a cue to bring theirs out as well. They roll the dough into a rectangle, put on their filling, and then have to cut the roll in half to expose the filling when it’s twisted. That really confuses a lot of them, and I have to admit, I’d probably be a bit confused by it too. They twist away, then slip the breads into huge bags to prove a second time. Howard pulls his out and it’s a pretty good size. Christine fusses with hers, wondering if more filling should be showing. Crowns get popped into the oven. Ruby’s starts to brown too quickly, so she covers it in foil. Howard’s first out, again, and he starts glazing his, wondering why he seems to be ahead of everyone else this bake. More crowns come out and get glazed. Sue helps Frances cool hers by fanning it. They scatter sliced almonds over the breads and time is up. Paul and Mary come in and Paul says they all look pretty good, which is a nice start. Frances is first, and hers gets thumbs up. Christine’s twist and shape aren’t very even. Glenn’s needed to be a little bit thicker, but has a good bake. Kim’s gets high marks. Howard’s filling wasn’t spread evenly. Ruby’s looks tempting and Mary observes that it looks almost perfect. Beca’s has a bit too much frosting drizzled over. The lineup, from last to first: Howard, Beca, Glenn, Christine, Kim, Frances, and Ruby. Ruby’s does look really amazing. Now I want a slice of that. Dammit. The Bakewells get started on their showstoppers right away, instead of getting going the following day, as usual. Because the doughs need time to come together and rise. They have to do two different types of European sweet buns. They have half an hour to start the doughs that night and four hours the next day. VO tells us most of the Bakewells are doing brioche, which needs to chill for 12 hours, to solidify all the butter in it and make it a usable dough instead of a wet mess. Doughs are mixed and popped into the fridge. The next day, back they come and get started on fillings etc. Beca has some rum-soaked prunes for her chocolate brioche and is also making a cardamom-spiced lemon iced bun. Mmmmm, lemon and cardamom. Chrsitine’s doing schnecken buns and vanilla custard skolebrod, both of which sound yummy. Doughs come out of the fridges and fillings are mixed in. Looks like the doughs are really, really stiff now. Glenn’s made a vanilla-infused dough for his almond and apricot brioches, and he’s also doing sticky caramel kanelbullen. Mmmm, caramel. Howard is making peachy buns and German baumschnecken. Kim’s doing a kumquat marmalade to put in her chocolate brioche. That sounds really yummy. She’s also doing Danish kanelsnurrer with almond cream and apricot. God, these bakes are making me crazy. I just want every single bun that’s been mentioned. Sue and Kim try to decide exactly what personality types each of the other Bakewells are. No big surprises, really. They start shaping their rolls prior to their second proof. Sue tries to steal the boozy prunes. Ruby’s doing twisted Swedish kanelbullar and saffron St Lucia buns. Hey, I made St Lucia buns once! I read about them in an American Girl book. They were pretty yummy. My mom wouldn’t let me wear a wreath with actual burning candles on it when I served them, though. Which I think was fairly sensible. Ruby starts shaping her kanelbullar, twisting two different doughs together into pretty spirals. Others begin measuring out rolls and things prior to cutting up the buns. Frances is doing hot cross brioches and rhubarb and custard kolaches. They’re going to be presented as a game of noughts and crosses. Cute. Yet another history lesson: Sally Lunn buns, which were favoured by the posh people who visited Bath in the 18th and early 19th centuries. Sally was allegedly a French Hugeonot refugee who fled to England and started selling French brioche-style buns. A century after they were created, the Sally Lunn buns seriously caught on and were served at the pleasure gardens of the town during the public breakfasts. Mel digs into one and declares them really delicious. Back at the Bakeoff, Sue affects a German accent to announce they only have half an hour. Howard lays spoons across the tops of his so, when they bake, they’ll get a little cleft, just like a peach. Clever. Some buns come out and bakers test them for doneness. With five minutes to go, buns come out of the oven (heh) and they begin glazing, finishing, and serving them up. Glenn’s knots completely come apart and he doesn’t even manage to get them served. Sue hugs him. Christine’s buns are up first. Good flavours, good textures on the first one, which has jam and custard and looks delectable. The second one is marvelously fruity and Mary declares them absolutely scrummy. Paul’s quite impressed. Frances’s noughts and hot cross brioches are next. The crosses are good, but overproved. The others are good, though. 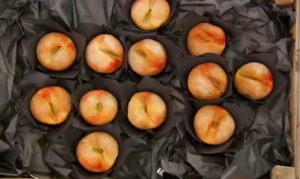 Howard’s baumschnecken and the peaches: the peaches look absolutely amazing and he’s serving them in a little crate, which is pretty adorable. The peaches, unfortunately, don’t taste of peach, while the others are really dry. Too bad. Time for Ruby’s kanelbullar and St Lucia buns. She presents them and, once again, she apologises right up front. This is getting tiresome. Stop looking for validation, Ruby. She thinks they’re overbaked. Tha kanelbullar are declared delicious and Mary really likes the St Lucia buns. Kim presents her almond, cardamom, apricot, and chamomile kanelsnurrer and her kumquat marmalade brioches. Mary thinks the kanelsnurrer is dry and neither she nor Paul can really taste the cream. The brioches are underbaked. Sticky caramel kannelbullen and almond and apricot brioches from Glenn, so I guess he did manage to get some of them on the plate. He thinks they look awful. Paul and Mary clearly agree, plus the kannelbullen flavours don’t work at all. Like, they’re really, really awful. On to the brioche, which are dry and overbaked. Beca’s rum-soaked prune buns and lemon and cardamom tea buns are next. The brioche are great, according to Paul, and Mary likes the lemon icing on the iced buns. Judgment time. The judges repair to the tea tent for a chat. Frances and Ruby have both done well, while Howard and Glenn are in the bottom. And they both know it, too. Glenn’s actually fully prepared to go home. He’s crying a bit and everything. Aww, poor Glenn. I rather like him. He definitely has a great sense of humour. Time to find out who’s going home, and who’s on top. Mel and Sue have some fun with announcing star baker by saying that the person who’s won this week is already so full of themselves they’re running a huge risk by further building them up. So, of course, it’s Ruby. Now STOP APOLOGISING all the time. Going home is…Howard. Glenn can’t believe it. Too bad. Those little peachy buns really did look amazing. Paul says it’s a shame, because he really liked Howard. Mary’s a bit more hard-edged about it, surprisingly, reminding us that, if you have two bad days, you simply have to go. Everyone hugs and Howard cries a little. Glenn interviews that he has to work extra hard to improve. Next week, suet puddings, religieuses, and puff pastry showstoppers.